Jesus vs. 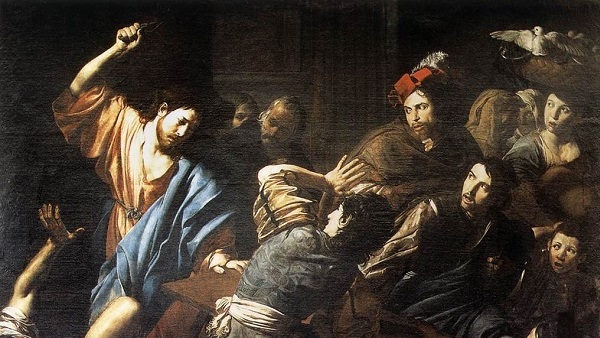 The Moneychangers: Was He Anti-Finance Or Anti-Religious-Rip-Offs? The confrontation with the moneychangers has been used to enlist Jesus into an ideological war against finance. There are many examples, but probably the best known of them is FDR’s inaugural address in which he extensively referenced this text. “Practices of the unscrupulous money changers stand indicted in the court of public opinion, rejected by the hearts and minds of men. Is that really what this story means? Is it a general indictment of financial commerce? I don’t think so. We’ve been tracing Jesus’ journey from Galilee down to Jericho into Judea and now to Jerusalem. The pattern has been that Jesus’ denunciations of wealth coincide with two circumstances: proximity to Jerusalem and proximity to the ruling class. Jesus is toughest on accumulations of riches when in Judea, least so when in Galilee. He’s tough on religious and political elites (often the same groups) who extract wealth, as opposed to those who create wealth through work, or even investment. That latter point – tolerance towards financial dealings – was counter-cultural in at least two ways. ‘Conservative,’ that is aristocratic, elites were tied to the land; the newly forming order of financial markets would have been somewhat alien to them. But Jesus tells several parables which involve finance, as opposed to agriculture. There is the Parable of the Unfaithful Steward, and the Parable of the Talents, both of which seem oriented towards a positive view of the investor. In fact, at least one, and probably both, of these parables put God in the role of the investor. This would be odd if Jesus thought of finance as an unrighteous profession. Therefore, it is unlikely that Jesus’ confrontation with the money changers was simply because they dealt with finance. Given Jesus’ criticism of the temple and its elites, it seems more likely that their location on temple grounds was at least one part of His objection. The account specifies that He confronted them when He entered the temple, therefore they were on temple grounds. He specifically criticizes their presence there, contrasting it with Solomon’s temple which was to be ‘a house of prayer for all nations’. Instead, it had been turned into a “robbers’ den” – a reference to Jeremiah who also criticized the temple elites of his time. The text makes clear that this activity taking place on temple grounds was an issue. 16 and He would not permit anyone to carry goods through the temple. Mathew21:12 And Jesus entered the temple and cast out all those who were buying and selling in the temple, and overturned the tables of the moneychangers and the seats of those who were selling doves. I’ve highlighted several phrases to draw attention to some points which might be missed otherwise. One of them, I’ve already discussed, is the fact that the moneychangers were confronted after Jesus entered the temple, therefore they were on temple ground. Also, please note the phrase ‘”robber’s den”. I’ve already mentioned that this is borrowed from Jeremiah. But it’s important to see how appropriate this designation was. Jesus calls this a robber’s den because they are robbers. The temple system was dishonest in numerous ways, which we can discuss in great detail elsewhere. So, the temple shekel was double weight, which no doubt had pious justifications about the glory – literally the heaviness – of the matters of God. But the bottom line is that worshippers had to pay twice the amount, due to dishonest weights and measures. And the mechanics of this financial abuse were carried out by the money changers. That is why Jesus calls them ‘robbers’. You may notice that I highlighted phraseology which singles out the dove merchants as particular objects of Jesus’ ire. Matthew’s and Mark’s Gospels both mention the doves. Luke’s account is generally similar but doesn’t mention dove merchants. John, however, focuses heavily on the dove sellers, so heavily that he portrays Jesus as speaking only to them. What is the significance of the doves? Under the Torah, the sacrifice of doves was a provision for the poor. Poor people bought doves. The whole system of money-changing was dishonest, but the dove sellers who charged double because of the dishonest shekel were specifically the group which was hurting the poor, such as were Joseph and Mary when they first started out. Luke doesn’t mention doves, probably because his intended gentile audience would not understand this detail of Torah. But John has Jesus addressing only the dove-sellers. Why would John be particularly focused on the dove merchants? Remember John was probably the closest to Mary who, as we saw above, was herself exploited by this particular group. Jesus arranged for Mary to adopt John at the cross and according to early church historians, John and Mary stayed together, traveling to Ephesus. But Jesus was not the only one who was consumed. It was immediately after this incident that the chief priests and the scribes decided to destroy him. There were consumed with fear at His popularity among the people. Up until then they had merely been irked by Jesus because of His challenge to their religion, but now He was challenging their money, and for that, He had to be murdered.